Today is the last day of my 2016 Travels. 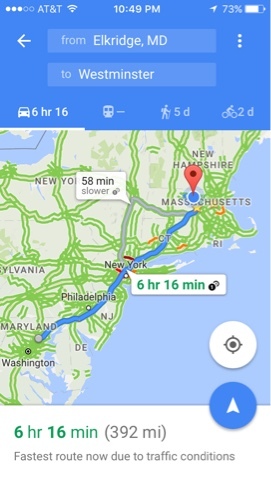 The map above is what Google gives me but my trip home is a bit longer than what you see as I get off at exit 11 on the NJ TPK and take the Garden State Parkway to the NY Thruway over the Tapans Zee Bridge to I684 north to I84 to MA and then back roads to my house. As I mentioned in a previous blog post, I will be posting until I get caught up with all the things I did while visiting my Son and family in Maryland. Lastly I will discuss what went well and what could be improved for future travels. So stay tuned for a few more weeks to find out what I learned on this trip. I think you will find it interesting. Isn't the East coast too wet & rainy ? bet van dwelling in that area must be a challenge. Yes the east coast is wet & rainy at times, not to mention the days with high humidity. The weather brings some challenges. At the SE GTG in Alabama was in a field and when it rained I moved closer to dirt road where the ground wasn't soggy. The Prius has low ground clearance and I do mot take the risk of sinking in some field. There are ways to compensate in the east and the Prius can help. The Prius temperature controls do operate in "Ready Mode" allowing you to sleep in the Prius with heat for cold and air conditioning for when it's hot out. I do have screens that I don't generally have to use as I am home before it gets too hot in the Southeast. Overall, I like the warmer dryer climate but I've figured out how to deal with all seasons. If you have specific interests let me know.